My friend and partner, Gideon, is an eight year old German Shepherd who has developed degenerative myelopathy. Gideon injured his back while jumping. The spinal cord became compressed and he has been fighting partial paralysis in his rear legs ever since the injury. The back injury began a journey into Degenerative Myelopathy (DM). In hopes of learning something that would help Gideon, I have been doing some research and learning about this debilitating disease that will eventually paralyze my partner without treatment of some kind. Degenerative Myelopathy (DM) was first described as a specific degenerative neurological disease in 1973. The age at onset is 5 to 14 years, which corresponds to the third to sixth decades of human life. Although a few cases have been reported in other large breeds of dogs, the disease appears with relative frequency only in the German Shepherd breed, suggesting that there is a genetic predisposition for German Shepherd dogs (GSD) in developing DM. Dogs will present with a general weakness in their rear legs. Initial signs include limping, dragging the back foot or feet, and an inability to sit straight for long periods of time. Sometimes the rear toenails will be short caused by the continuous dragging of the feet. Open wounds will appear on the top of the feet as well. As the disease progresses, the dog loses the ability to walk and will stumble, fall, and drag its rear legs in an attempt to walk. Diagnosis of DM is made by a history of progressive spinal weakness that may have a waxing and waning course, or be steadily progressive. This is supported by the neurologic findings of spinal cord dysfunction. Clinical examinations are generally normal except for an elevated cerebral spinal fluid (CSF) protein in the lumbar cistern. Electromyography (EMG) examination reveals no lower motor unit disease, supporting the localization of the disease process in the white matter pathways of the spinal cord. Spinal cord evoked potentials recorded during the EMG do show changes which help determine the presence of spinal cord disease. Radiographs of the spinal column including myelography are normal (other than old age changes) in uncomplicated DM. Dogs will present with a general weakness in their rear legs. Initial signs include limping, dragging the back foot or feet, and an inability to sit straight for long periods of time. Studies have shown that DM is caused by an autoimmune disease attacking the nervous systems of patients, leading to progressive neural tissue damage. In many respects, DM is similar to Multiple Sclerosis in human beings. In fact, based upon new data concerning the pathology of MS, it can now be said with some degree of certainty that DM is MS in dogs. Treatment of DM of GSD is directed at the pathologic processes that trigger how immune-complexes circulate. These immune-complexes lead to cell damage in the vessels of the CNS and the increase of inflammatory cells. The inflammatory cells release prostaglandins and cytokines (point of action of vitamin E and C) which leads to the activation of tissue enzymes and the formation of oxygen free-radicals (point of action of acetylcysteine) which, in turn, leads to tissue damage. The cause of this autoimmune disease is not known, but there are environmental and toxic factors that lead to its development. Use of exercise, certain vitamins and selected drugs have delayed or prevented progression of DM in many afflicted dogs. Exercise is extremely important in maintaining the well being of affected dogs, maximizing muscle tone and maintaining good circulation and conditioning. Swimming and brisk 15 minute walks have been shown to be most effective. Dogs should follow a schedule of one day of exercise, one day off. If the patient exhibits muscle or joint stiffness on the day following vigorous exercise, try ginger, garlic, mustard and feverfew to reduce inflammation. Alternately, carprofen (Rimadyl 2 mg/kg twice a day) may help make the patient more comfortable. New information suggests a change in diet might play a more significant role in the progression and development of diseases like DM. Elimination of toxins from pre-processed food may assist in preventing a number of immune related disorders. A more natural diet is recommended to eliminate the preservatives added to most commercial dog food and to add the beneficial vegetables and herbs needed to help in correcting this defect and allow the immune system in DM dogs to stabilize. This mixture can be frozen ahead of time and allowed to thaw in the microwave. If commercial dog food is fed, adding carrots, broccoli, spinach, and soy will improve the commercial food. The only commercial food which fulfills many of the goals is Nature's Recipe Canine Vegetarian Diet, available from many specialty pet supply stores. Over the last 2 decades, studies have found 2 medications which appear to prevent progression or result in clinical remission of DM in many (up to 80%) of the patients. These medications are aminocaproic acid (EACA) and n-acetylcysteine (NAC). It is recommended giving EACA as a solution, using the generic product. This product, while designed for injection, can be mixed with chicken broth to provide a palatable solution for oral usage. For dosing, mix 2 parts of aminocaproic acid solution (250 mg/ml) with 1 part chicken broth and give 3 ml of this mixture orally every 8 hours for two weeks, then reducing the dose to twice a day. The only side effects that have been attributed to EACA have been occasional gastrointestinal irritation. This presents a problem only in a few patients, usually who have pre-existing GI problems that the medication might exaggerate. N-acetylcysteine is a potent anti-oxidant which has powerful neuroprotective effects. A recommended dose is to give 75 mg/kg divided in 3 doses a day for 2 weeks. Then, give the 3 doses every other day. The N-acetylcysteine comes as a 20% solution and must be diluted with chicken broth (or other compatible substitute) to 5%. Otherwise, it will cause stomach upset and can produce vomiting. Giving fresh ginger 30 minutes before and giving the NAC with food (or on a full stomach) often reduces this effect. Pain relief can be instigated with the use of carprofen (Rimadyl 2 mg/kg twice a day) to help make the patient more comfortable. Vitamin supplements have been studied and have been shown to help dogs with DM. Vitamin C works with vitamin E and helps regenerate vitamin E, helping its antioxidant effect. For GSD’s under 2 years of age, give 250 mg vitamin C twice a day. For GSD’s over 2 years of age, give 500 mg of vitamin C twice a day. Vitamin E is a potent antioxidant and reduces fat oxidation and increases the production of HDL cholesterol. At higher doses it also decreases production of prostaglandins and leukotreines. As such, it is a potent anti-inflammatory drug. For GSD’s under 2 years of age, give 400 IU of vitamin E daily. For GSD’s over 2 years of age, give 800 IU of vitamin E daily. In DM, there is altered absorption of some B vitamins and supplementation can correct this. If your dog is healthy, then give high potency B-complex (containing approximately 50 mg of most of the B components). If your dog has DM, give stress formula B-complex containing 100 mg of most of the B components. Glucosamine and Chondroitin is a safe, all-natural dietary supplement that can effectively treat arthritis and osteoarthritis pain, and are important for maintaining healthy joint tissue and in the repair of joint damage. In clinical studies, it has shown to help ease arthritis pain and increase the range of motion. The supplement helps provide and maintain lubricating fluid in joints and cartilage. Nutritional yeast, in powder or flake form, is a good source of the B-complex vitamins, trace minerals, and some protein. It is not expensive. A heaping tablespoon of yeast may be sprinkled on the diet, as an alternative to giving your dog a B-complex pill. Gideon first showed signs of the disease in the summer of 2000. 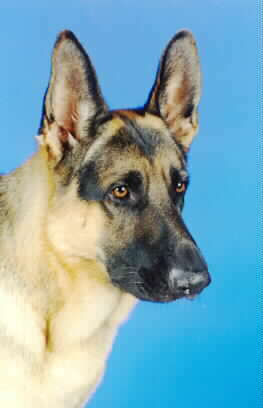 Gideon is showing very few signs of degenerative myelopathy at this time (December 2002). He is on a regimen of glucosomine and chondroitin tablets every day as well as a modified diet. On the days he is limping, he is given Rimadyl. My veterinarian has also given him injections of dexomethasone to relieve some of the inflammation. With this regimen, it has been two years without a worsening of the disease. July 2003 -- Gideon turned 8 years old this year and has been on the fresh food diet (mixed with veggies, vitamins B, C, and E, glucosomine and chondroitin, and the spices ginger and garlic) for 3 years now. Gideon is also given raw chicken necks for the extra cartilage. (RAW .. not cooked) He also gets perfomance-grade dog kibble by Purina and a "Scooby" snack once a day. Gideon has occasional episodes of rear leg weakness and has only required one shot of dexomethasone in the last 10 months. He runs and walks without a limp and has a "hot spot" that will not heal on the lower part of his rear leg where he dragged it over the dog door. We made a bigger dog door, and the spot is healing a bit. He is showing more and more signs of DM with occasional mishaps with urine incontinence and loss of muscle tone. He is having more and more difficulty "squatting" when having a bowel movement. His legs tend to splay or give way on him. His walking ability though limp free this month, does show a sign of "swaying" or unbalance. February 2004: My vet and another veterinarian neurologist at the University of Florida are undecided if Gideon is a true victim of DM. Testing is "inconclusive". He has some advancing deterioration, but has not progressed to a point of complete paralysis. So .. does he or doesn't he? I don't know and will accept whatever comes. When I asked about surgery, I was not guaranteed any positive results. So I opted out. He does seem to have more days of "limb dragging" behavior and then there are those days when he needs the help of a towel lift to make it outside. sighs .. so who knows. He will be 9 years old on March 16, 2004. The generic form of EACA solution can be obtained from American Regent, 1-(800) 645-1706 (outside of NY). The generic drug from American Regent may be obtained through prescription with the help from a local pharmacy. An alternative source for EACA is to have a compounding pharmacy make the solution from chemical grade EACA. One such pharmacy is WestLab Pharmacy in Gainesville, FL. They can be reached at 1-(800) 4WESTLA [1-(352) 373-8111, locally] and can mail the medication and bill the client directly. Want info on Belgian Sheepdogs?